MoSt Modular Shooting Ranges are sheltered facilities for a variety of shooting training types for law enforcement and private individuals. 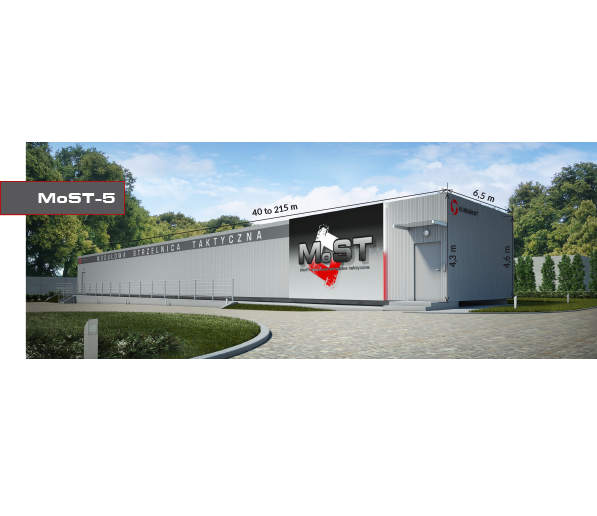 The MoSTs comprise steel modules which can be delivered to any viable location, positioned on a firm, paved ground and assembled together. A deployed MoST is not anchored or otherwise attached to the ground. The overall deployment time for a MoST from submitting a purchase order to commissioning is between 180 and 360 days, depending on the MoST size. 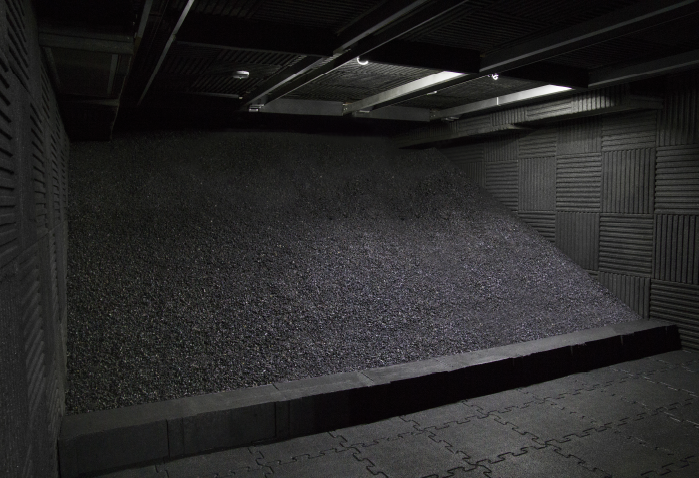 environmental protection by preventing environmental release of combustion dust and a low exposure to noise. 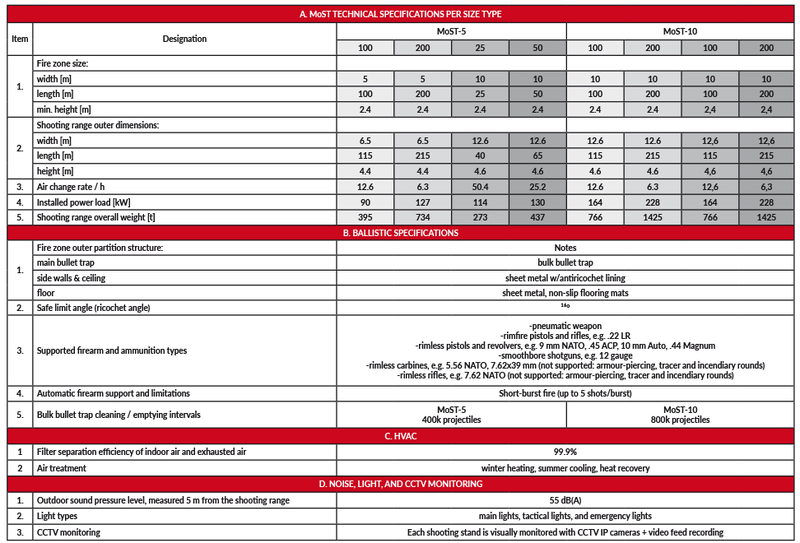 The MoST-5 and MoST-10 have the Certificates of Compliance issued by the Military Institute of Armament Technology in Zielonka, Poland. Each MoST comprises a series of steel modules, 2.5 m wide, 2.5 m high and 6 or 12 m long (depending on the size type). 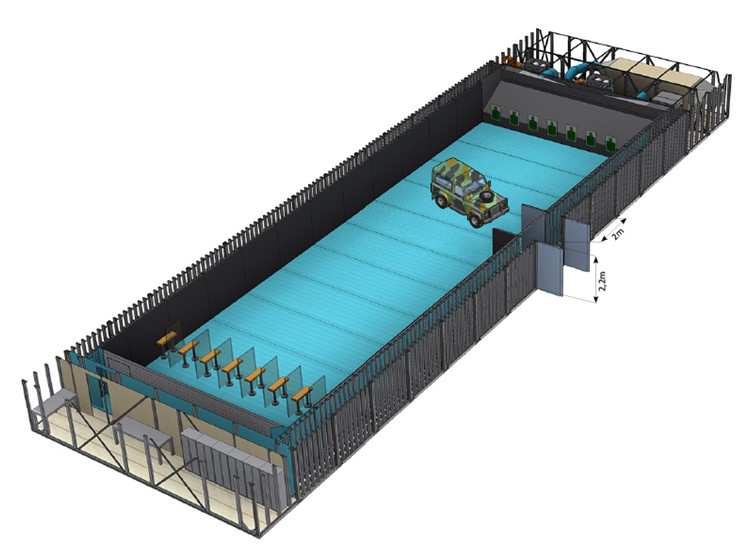 When assembled, the modules form an integrated facility capable of supporting various shooting range related functions, including the most important one: the fire zone, and the auxiliary functions required for a fully professional tactical firing training range. The modular design of the MoST allows modification of the standard shooting range length in each size type by addition or removal of the modules, as required by the project owner. Each MOST shooting range can also be disassembled and relocated any time during the operation. The standard width of each shooting range module is 2.5 m; hence, the addition or removal of one module changes the shooting range length, which is a multiple of 2.5 m and and number of modules. All modules exposed to live fire are designed as welded frames which are lined with sufficiently strong, hard-wearing steel sheet which resists piercing with bullets. The modules are delivered separately from one another to the installation site, at which they are placed on a level and hard-paved ground, aligned together, and assembled into one facility. With the modules assembled into one, integrated facility, the side walls and the ceiling surface are lined with façade panels which provide a sufficient thermal and noise insulation performance. The MoST is ready for operation when connected to electrical power and furnished with the required fixtures. This is the fire control room. The logistic module houses the control workstation of the range master, provided with a display unit for viewing the CCTV feeds from the fire lane hall, and controls for operating ventilation, lights, sound and other technical equipment. 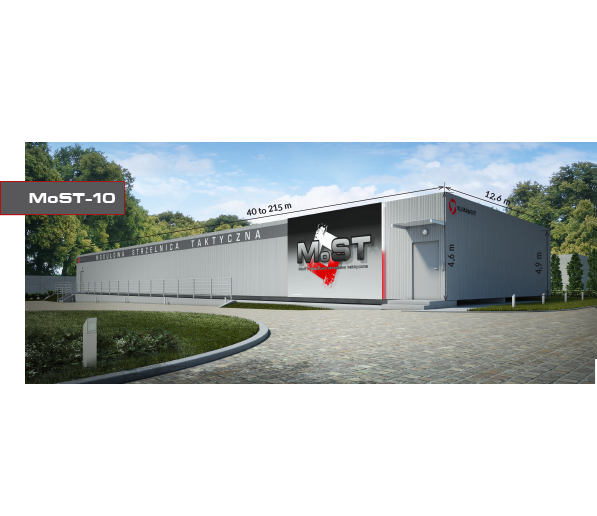 The logistic module features one entrance door from the outside and a bulletproof door leading to the communication module. The logistic module equipment configuration is customizable on order. The logistic module can be expanded with a number of counterparts to provide a medical station, a briefing room, a locker room, etc. This module provides a passageway between the logistic module(s) and the shooting stand module. The communication module features an Air Wall expansion chamber, which supplies fresh air to the shooting range facility. The internal lining of the module comprises antiricochet panels. This module houses shooting stand booths, separated with removable partition walls. Each shooting stand has an overhead lamp and CCTV IP cameras. A target carrier control panel can be provided on request for each shooting stand. The internal lining of the module comprises antiricochet panels. 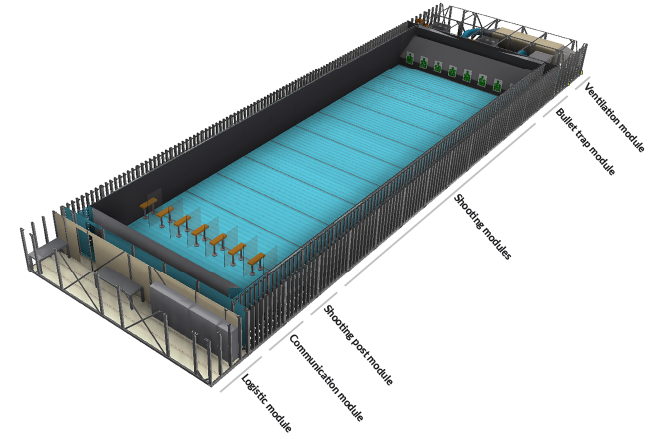 The 2.5 m long shooting modules are installed to form the fire lane hall to form fire lines 25, 50, 100 or 200 m long. The internal lining of the modules comprises antiricochet panels. Mobile bullet traps can be provided on request for deployment in the fire lane hall. When deployed in parallel with both side walls, the MoST enables a 180° firing sector; however, armour-piercing, tracer and incendiary rounds cannot be fired. This module features solid-block and bulk bullet traps across the entire module width. The bullet trap module also features pre-installed top and bottom connections for the ventilation ductwork. The internal lining of the module comprises antiricochet panels. The bulk bullet trap has a capacity of approximately 100,000 shots per each fire line. Periodic treatment reconditions the bulk bullet trap for continued use. This module is made of two coupled modules, each 2.5 m wide. The module houses a heat recovery air supply and exhaust unit and ventilation filter units with a filter separation efficiency of 99.9%. 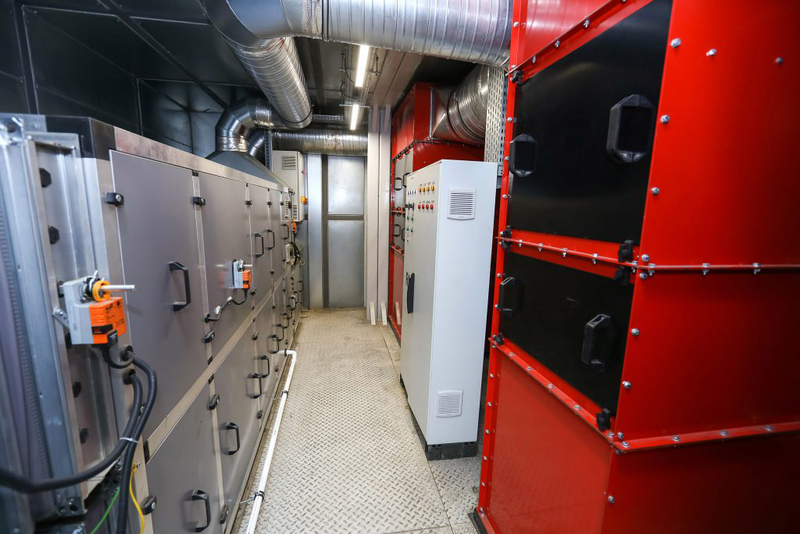 Aside from its unique air filtration system, the AHU feature a heat recovery systems. This provides a significant energy efficiency for electric heating of the air supply is required in winter and air conditioning in summer. The automatic controls of the ventilation system maintains steady indoor air parameters and comfort in all seasons. An optional version of the shooting module which is available on request. The module features garage-style door through which vehicles or other large objects can be deployed in and removed from the fire lane hall. The state-of-the-art solutions designed for the MoST facilitate individual shooting practice, and shooting practice in pairs or task teams which are freely configurable. With computer-aided control systems, the ballistic feature can be programmed with various firing scenarios. firing live ammunition with the maximum projectile muzzle energy of 3600 J.
high-quality components for low-noise and reliable operation. can be integrated with target carrier systems and target lifts. The tactical lamps comprise a system of LED RGB lamp fixtures (which provide white and colour light) installed within the file lines to illuminate the fire zone and targets. The integrated and fully programmable audio system can output any sound required by the fire scenario. integration of visual cameras for projectile hit spot determination. 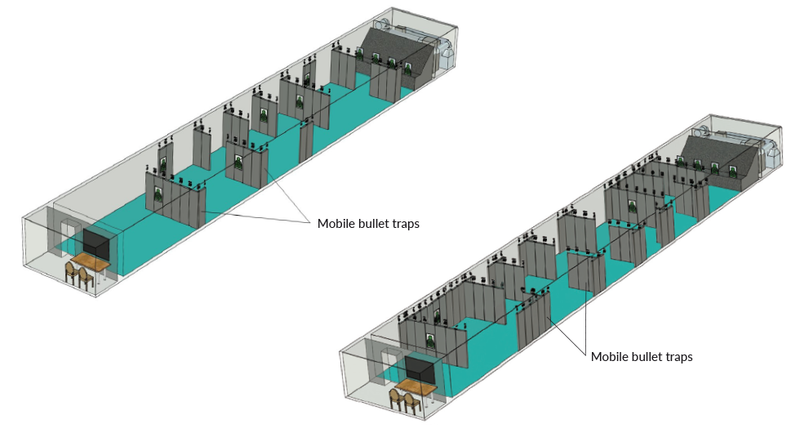 The optional mobile bullet traps can be deployed in any configuration in the fire lane hall to build shoot houses for tactical live-fire training. See a configuration example below. MoSt Modular Shooting Ranges are entirely closed facilities, designed for all kinds of shooting practice and training forms performed within fixed and moving firing lines.